↑ "Vince McMahon's house in Greenwich, CT (Google Maps)". February 19, 2008. 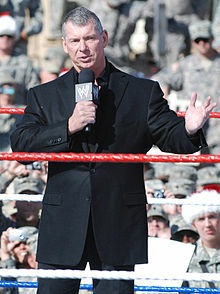 ↑ Vince McMahon News, Info And Videos. WrestlingInc.com (1945-08-24). Retrieved on 2012-06-09. ↑ "IGN: Vince McMahon Biography". IGN.com. สืบค้นเมื่อ September 14, 2007. ↑ "WWE says CEO resigns, names chairman as new CEO". Reuters. September 16, 2009. สืบค้นเมื่อ April 15, 2010. ↑ "The parent's guide to WWF". Sunday Mirror. April 29, 2001. Archived from the original on October 31, 2007. สืบค้นเมื่อ July 4, 2007. ↑ "Dyslexia TV Alumni". Dyslexia. สืบค้นเมื่อ September 15, 2008. ↑ "Famous Dyslexics". Dyslexia Mentor. สืบค้นเมื่อ September 15, 2008. ↑ 10.0 10.1 10.2 "Wrestling Information Archive – Pro Wrestling Illustrated Award Winners – Feud of the Year". Pro Wrestling Illustrated. สืบค้นเมื่อ July 18, 2007. ↑ "Wrestling Information Archive – Pro Wrestling Illustrated Award Winners – Match of the Year". Pro Wrestling Illustrated. สืบค้นเมื่อ July 26, 2007. ↑ "WWE Championship official title history". WWE.com. สืบค้นเมื่อ July 18, 2007. ↑ "ECW Championship official title history". WWE.com. สืบค้นเมื่อ July 18, 2007. ↑ "Royal Rumble 1999 Results". PWWEW.net. สืบค้นเมื่อ August 22, 2007. ↑ Meltzer, Dave (January 22, 1996). "Jan. 22, 1996 Wrestling Observer Newsletter: Results of the 1995 Wrestling Observer Newsletter Awards, 1995 Record Book, Tons More". Wrestling Observer Newsletter. ↑ The oldest wrestler to win the World Wrestling Entertainment (WWE) Championship is Vince McMahon (USA) aged 54 years and 21 days on 14 September 1999. ↑ Jamie DeLoma (May 14, 2007). "WWE chief pumps up graduates". Archived from the original on May 17, 2007. สืบค้นเมื่อ May 14, 2007. ↑ Anrdrew Rote (May 13, 2007). "Mr. McMahon becomes Dr. McMahon". สืบค้นเมื่อ May 14, 2007. หน้านี้แก้ไขล่าสุดเมื่อวันที่ 17 กรกฎาคม 2561 เวลา 21:08 น.